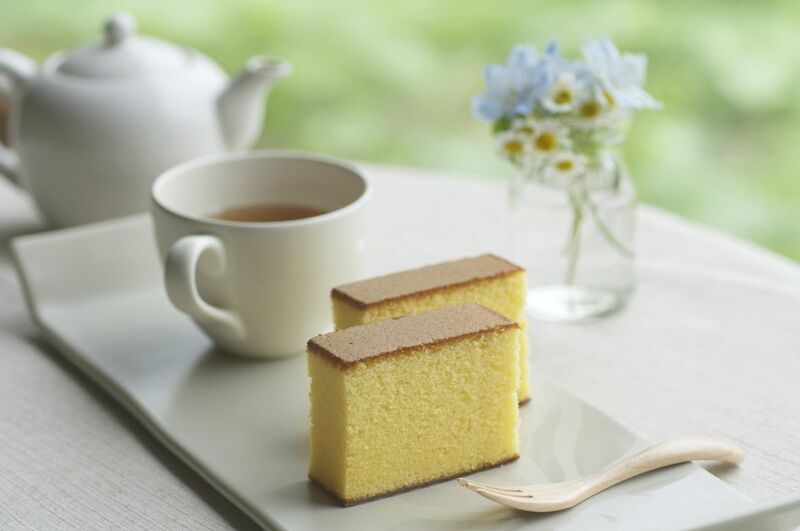 Kasutera is a sponge cake made from a few ingredients. The origin of kasutera is believed to have come from Portuguese missionaries who introduced European sweets to Nagasaki. It's a recipe to make a kasutera-style cake. Cover the inside surface of a large loaf pan or two small loaf pans with parchment paper. Whisk eggs in a large bowl using an electric hand-mixer, adding sugar gradually. Place the bowl over warm water in another large bowl. Further, whisk eggs until they become light yellow (almost white). Mix the milk and honey mixture in the batter. Add sifted flour in the bowl and mix gently with a spatula. Pour the batter in the loaf pan and tap the pan gently on the table to release any air bubbles. Bake at 360 degrees F for about 10 minutes and turn down oven to 280-300 degrees F and bake for about 40 minutes, or until done. To check if the cake is done, poke it with a bamboo skewer. If the skewer comes out clean, it's done. Flip the pan upside down on a cooking sheet or platter and remove the pan from the kasutera. Remove the parchment paper and cool the cake. Wrap the cake with plastic wrap and store until the next day. It tastes better the next day. Cut the kasutera into 3/4 inch thick slices.